Had a good quiet day today. The kids were up early. Did a load of washing and while that was on Jordy and i went and played on the jumping pillow. Met up with some older kids who were happy to have Jordy join in their chess game and then the four of us played duck, duck, goose on the jumping pillow. LOL! Had to open up a new bank account to invest our house money in. We'll have a somewhat tight budget with living off the interest payments cos between when we made the decision to do this and now the interest rates have dropped soooo much (typical) so finding a good account was important. Ended up at the Bank of Queensland. 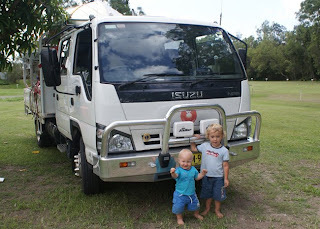 Had a look online at the Queensland National Parks site to get some info on our next camp area. They have a good website, EPA that i imagine we'll be using in the future. The kids have had a great day running around the camping flats here. Darcy is practising his walking by walking back and forth between the bikes, red car and truck etc and chasing Jordy. And Jordy has been dozering up his sugar cane (mowed grass) and floating boats (leaves) in his river (a container of water). I think Jordy is overtired from his big day yesterday and being up early this morning cos he has been grouchy and acting up and pushing Darcy and generally being a bit of a turdlet but he refuses to have a nap so he'll be in bed early tonight. Tim put the golden Lions badge on the front of the truck. Looks good! I decided to cook a chocolate brownie in the microwave for dessert for tonight. We were supposed to have friends call around for a BBQ but they had to cancel and are coming for breakfast tomorrow instead. And seeing as you can't eat chocolate brownie for breaky i'll just have to eat more of it myself! LOL! It came out really nice so one tick for microwave cooking. Mum and Dad phoned and they had figured out the problem with their solar panels. Tim told them to call Battery Traders up here near the Gold Coast so they had to leave Ballina early to get it fixed (some kind of problem with the battery and it could not be allowed to drain or something). Tim had spoken to them a few times about an inverter for us (and also about solar when we were considering it for ourselves) and they were really helpful and upfront about everything so i'll give them a bit of a rap! Thanks, Steve! They arrived around 5pm, a quick set up and then we got a BBQ dinner ready and sat around for a chat. Darcy sounds like he might have a decent night, he's only woken once so far and i put him to bed 2+half hours ago so i'm sitting outside in the cool breeze and having a cup of mint green tea and some brownie!